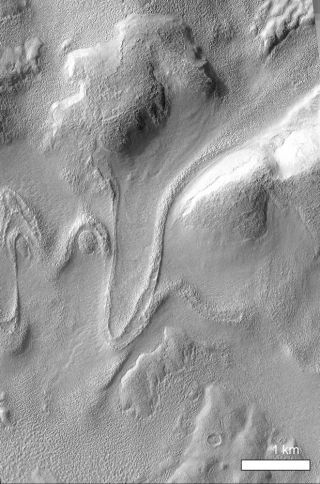 Orbital photos from NASA Mars Reconnaissance Orbiter shows lobate-shaped glacier flowing down the north inner wall of crater Greg, on the planet Mars. The wall slopes downhill to the south (bottom) part of the frame. Note how flow lines drape around a small hill, on left side of the glacier. Closeup view shows chevron texture on riverbed floor, indicating how the ice-rich material flowed fastest in the middle and was retarded along the channel walls. Hartmann and his colleagues presented the new Mars climate research today (Oct. 16) at the annual meeting of the American Astronomical Society's Division for Planetary Sciences in Reno, Nev.
Today's Martian landscape is not known for its glaciers, but previous research has shown that during some periods of Mars' history, the planet's rotational axis has tilted more than 45 degrees. When this happens, climate models suggest that the polar ice cap tilted toward the sun evaporates, lingering in the atmosphere as water vapor and increasing the chances of snowfall in the hemisphere tilted away from the sun. Sketch map of mid-latitudes on Mars, shows colored spots marking climate model predictions of maximum ice deposition on Mars during periods of extreme axial tilt. Reddest colors indicate peak ice deposits. Crater “Greg,” with unusual concentration of strong glacial features, is light-toned circle near center of ice deposition region in the lower right. Now, the researchers have combined four different measurements of Martian geology and climate, including climate predictions, the presence of glaciers, the ages of glacial surface layers and radar measurements of ice. The measurements and models are all consistent with one another, the researchers found. "The bottom line is that the global climate models indicate that the last few intense deposits of ice occurred about 5 million to 15 million years ago, virtually centered on Greg crater, and that's just where the spacecraft data reveal glaciers whose surface layers date from that time," Hartmann said. "If global climate models indicate specific concentration of ice-rich features where and when we actually see them on a distant planet, then climate modeling should not be sarcastically dismissed. Our results provide an important, teachable refutation of the attacks on climate science on our home planet."